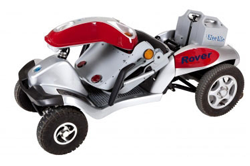 The Rover 4 mobility scooter comes with a full light package for safety, a keyed ignition for security, a nice wide 18 inch deluxe memory foam seat, big 10" pneumatic EASY-RIDE tires on the front wheels and 14" tires on the rear wheels to give the Rover 4 scooter a stable comfortable ride on most terrains. 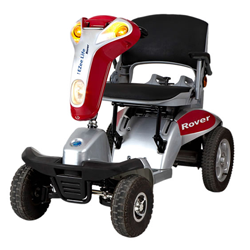 The EZee Rover 4 electric mobility scooters are the only mid-size folding scooter on the market, providing a sporty yet strong design which makes it ideal for indoor or outdoor use. The 15.5 miles cruising range means it can keep up with you all day long! This sleek electric 4 wheel scooter is one of the safest rides on the market and includes tail lights, turn signals, headlights, and running lights to make sure you stay accident free. The four point seat structure means 45% more stability on inclines and is constructed with high quality memory foam for comfort and pressure reduction.